Biography*: Ramiro II (24 April 1086 – 16 August 1157), called the Monk, was King of Aragon from 1134 until withdrawing from public life in 1137 (although he used the royal title until his death). He was the youngest son of Sancho Ramírez, King of Aragon and Navarre and Felicia of Roucy. His father had placed him as a child into the Benedictine monastery of Saint Pons de Thomières in the Viscounty of Béziers. As a respected monk there he was elected abbot of the Castillian royal monastery of Santos Fecundo y Primitivo in Sahagún and later was abbot of the monastery of San Pedro el Viejo at Huesca. Wanting to limit Ramiro's power within the Kingdom of Navarre-Aragon, his brother Alfonso the Battler had blocked his elections as bishop of Burgos and as bishop of Pamplona. In 1134 he had been elected bishop of Barbastro-Roda when the death of his childless brother made him one of the candidates for succession to the crown. Others put forward included Alfonso VII, king of Castile, who as a foreign king found little support, and the choice of the Navarrese nobility, Pedro de Atarés, grandson of Sancho Ramírez, Count of Ribagorza, the illegitimate son of Ramiro I of Aragon. At an assembly at Borja intended to resolve the succession, a misunderstanding alienated Pedro from his supporters, yet they were unwilling to accept the Aragonese-favored Ramiro, and in the end the kingdoms were divided. In Navarre, García Ramírez, a scion of the pre-union royal family of Navarre and protégé of Alfonso VII was chosen king, while in Aragon the choice fell on Ramiro, who suspended his monastic vows to take the crown. The reign of Ramiro the Monk, as he is known, was tumultuous. At the beginning of his reign he had problems with his nobles, who thought he would be docile and easily steered to their wishes, but discovered him to be inflexible. In order to produce an heir, he married Agnes, daughter of Duke William IX, Duke of Aquitaine. Once wed, his wife bore a daughter, Petronilla, who was betrothed to Ramon Berenguer IV, Count of Barcelona at the age of one. The marriage contract, signed at Barbastro on 11 August 1137, made Petronilla the heiress to the crown of Aragon, which in event of her childless death would pass to Ramon Berenguer and any children he might have by other wives. Ramon accepted Ramiro as "King, Lord and Father", 'renounced his family name' in favor of the House of Aragon and united the County of Barcelona with the Kingdom. This union created the Crown of Aragon, returning the previously-landlocked kingdom of Aragon to the position of peninsular power it had held prior to the loss of Navarre, as well as giving it a window to the Western Mediterranean it would come to dominate. Biography*: Sancho Ramírez (c. 1042 – 4 June, 1094) was King of Aragon from 1063 until 1094 and King of Pamplona from 1076 under the name of Sancho V (Basque: Antso V.a Ramirez). He was the eldest son of Ramiro I and Ermesinda of Bigorre. His father was the first king of Aragon and an illegitimate son of Sancho III of Pamplona. He inherited the Aragonese crown from his father in 1063. Sancho Ramírez was chosen king of Pamplona by Navarrese noblemen after Sancho IV was murdered by his siblings. Sancho Ramírez succeeded his father as second King of Aragon in 1063. Between 1067 and 1068, the War of the Three Sanchos involved him in a conflict with his first cousins, both also named Sancho: Sancho IV the king of Navarre and Sancho II the king of Castile, respectively. The Castilian Sancho was trying to retake Bureba and Alta Rioja, which his father had given away to the king of Navarre and failed to retake. The Navarrese Sancho begged the aid of the Aragonese Sancho to defend his kingdom. Sancho of Castile defeated the two cousins and retook both Bureba and Alta Rioja, as well as Álava. Sancho Ramírez followed his father's practice, not using the royal title early in his reign even though his state had become fully independent. This changed in 1076, when Sancho IV of Navarre was murdered by his own siblings, thus prompting a succession crisis in this neighboring kingdom that represented Aragon's nominal overlord. At first, the murdered king's young son, García, who had fled to Castile, was recognized as titular king by Alfonso VI, while Sancho Ramírez recruited to his side noblemen of Navarre who resented their kingdom falling under Alfonso's influence. The crisis was resolved by partition. Sancho Ramírez was elected King of Navarre, while he ceded previously contested western provinces of the kingdom to Alfonso. From this time, Sancho referred to himself as king not only of Navarre but also Aragon. Sancho conquered Barbastro in 1064, Graus in 1083, and Monzón in 1089. He was defeated by El Cid, who was raiding his lands and those of his Muslim allies, at the Battle of Morella, probably in 1084. He perished in 1094 at the battle of Huesca, supposedly from an arrow while inspecting the walls of the Muslim stronghold. Sancho contracted his first marriage in c.?1065, to Isabella (died c.?1071), daughter of Count Armengol III of Urgel. They were divorced 1071. His second marriage, in 1076, was with Felicia (died 3 May 1123), daughter of Hilduin IV, Count of Montdidier. A third marriage—to Philippa of Toulouse—is sometimes given, but contemporary evidence records him as still married to Felicia at the time of his death. He was father of four sons: by Isabella, he had Peter, his successor; by Felicia he had Ferdinand, who was alive in 1086 but died within the next decade, Alfonso, who succeeded Peter, and Ramiro, who succeeded Alfonso. Peter (c. 1068 - 1104), known as "the Catholic", who ruled as King of Aragon and Pamplona from 1094 until 1104. Peter married Agnes of Aquitaine. Alfonso Sánchez (c. 1073 - 1134), known as "the Battler", King of Aragon and Pamplona from 1104 until 1134. He married Urraca of León, Queen of León, Castile and Galicia. Their marriage was annulled in 1112. Biography*: Felicia of Roucy (c.?1060 – 3 May 1123) was a queen consort of Aragon and Navarre. She was a daughter of Hilduin IV of Montdidier and his wife Alice of Roucy. She was married in 1076 to Sancho Ramírez, then king of Aragon after he had divorced his first wife, Isabella of Urgell. His accession to the crown of Navarre later that year made her the first Aragonese consort to also be Queen consort of Navarre. She is attested shortly before her husband's death and is now thought to have outlived Sancho (the supposed subsequent marriage of Sancho to a third wife, Philippa of Toulouse, appearing in a later chronicle, is now thought to be erroneous). Biography*: Ramiro I (bef. 1007 – 8 May 1063) was the first King of Aragon from 1035 until his death. Apparently born before 1007, he was the illegitimate son of Sancho III of Pamplona by his mistress Sancha of Aybar. Ramiro was reputed to have been adopted by his father's wife Muniadona after he was the only of his father's children to come to her aid when needed, although there is no surviving record of these events and the story is probably apocryphal. During his father's reign, he appeared as witness of royal charters starting in 1011, and was given numerous properties in the county of Aragon, and by the division of Sancho's realm on the latter's death in 1035, the county of Aragon fell to Ramiro with the title of baiulus or steward. This was part of what would prove to be a larger division: Navarre and the Basque country went to eldest half-brother García, the county of Castile was held by Ferdinand, while the counties of Sobrarbe and Ribagorza fell to Gonzalo and Ramiro received lands in Aragon to hold under García. Ramiro's exact status is vague. He was called king by his vassals, neighbors, the church and even his sons, yet he always referred to himself simply as Ranimiro Sancioni regis filio (Ramiro, son of King Sancho). Likewise, in his two wills, he refers to his lands as having been given him in stewardship: in the first by García, and in the second by God. 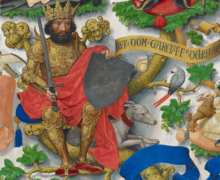 He is called regulus (rather than rex used for García) and quasi pro rege (acting as if king) in charters from Navarre. Due to his growing independence and the small size of his Pyrenean holdings, he is sometimes called a "petty king", Aragon a "pocket kingdom". Ramiro sought to enlarge his lands at the expense of both the Moors and his brother, García, the King of Navarre. Shortly after the death of his father (the date variously placed from 1036 to 1043), he supported the emir of Tudela in an invasion of the Navarre. While he was defeated in the Battle of Tafalla, he still was able to gain territory, including Sanguesa, and established a state of semi-autonomy. In 1043, apparently with the approval of García, he annexed Sobrarbe and Ribagorza, previously held by his youngest legitimate half-brother, Gonzalo. This union created a pseudo-independent Aragonese state, with its capital at Jaca, that would give rise to the Kingdom of Aragon. Before he was married, Ramiro had a mistress named Amuña with whom he had a natural son, Sancho Ramírez, in whom he confided the government of the county of Ribagorza. After annexation of Ribagorza and Sobrarbe, Ramiro began the advance from Aragon toward Huesca and Zaragossa. The first charter for the royal town of Jaca is attributed to him. It included well defined laws of protection even to non residents, and would set an example for urban rights until late in the Middle Ages. Ramiro died at the Battle of Graus in 1063 while trying to take the city. He was buried at the monastery of San Juan de la Peña, in Santa Cruz de la Serós. Theresa, who married William Bertrand of Provence. Ramiro's second wife was Agnes (Inés), perhaps a daughter of the Duke of Aquitaine. No children are known from this marriage. Biography*: Ermesinda of Bigorre (Aragonese: Ermisenda de Bigorra), born Gerberga or Gisberga (1015 – 1 December 1049), was a Queen of Aragon, a daughter of Bernard-Roger, Count of Bigorre and his wife Garsenda, Heiress of Bigorre. She was a member of the House of Foix, the sister of Bernard II, Count of Bigorre, Roger I, Count of Foix, and perhaps of Stephanie who married García Sánchez III of Navarre. Biography*: Sancho Garcés III (c. 994 – 18 October 1035), also known as Sancho the Great (Spanish: Sancho el Mayor, Basque: Antso Gartzez Nagusia), was the King of Pamplona from 1004 until his death in 1035. He also ruled the County of Aragon and by marriage the counties of Castile, Álava and Monzón. He later added the counties of Sobrarbe (1015), Ribagoza (1018) and Cea (1030), and would intervene in the Kingdom of León, taking its eponymous capital city in 1034. He was the eldest son of García Sánchez II and his wife Jimena Fernández. The year of Sancho's birth is not known, but it is no earlier than 992 and no later than 996. His parents were García Sánchez II the Tremulous and Jimena Fernández, daughter of Fernando Bermúdez, count of Cea on the Leonese frontier. García and Jimena are first recorded as married in 992, but there is no record of their son Sancho until 996. The first record of the future king is a diploma of his father's granting the village of Terrero to the monastery of San Millán de la Cogolla. 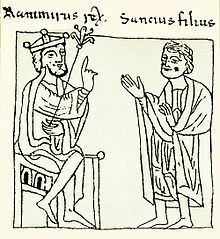 The king describes Sancho merely as "my son" (filius meus). The same diploma also shows the future duke of Gascony, Sancho VI, at the court of Pamplona. Sancho was raised in Leyre. His father last appears in 1000, while Sancho is first found as king in 1004, inheriting the kingdom of Pamplona (later known as Navarre). This gap has led to speculation as to whether there was an interregnum, while one document shows Sancho Ramírez of Viguera reigning in Pamplona in 1002, perhaps ruling as had Jimeno Garcés during the youth of García Sánchez I three generations earlier. On his succession, Sancho initially ruled under a council of regency led by the bishops, his mother Jimena, and grandmother Urraca Fernández. Sancho aspired to unify the Christian principalities in the face of the fragmentation of Muslim Spain into the taifa kingdoms following the Battle of Calatañazor. In about 1010 he married Muniadona of Castile, daughter of Sancho García of Castile, and in 1015 he began a policy of expansion. He displaced Muslim control in the depopulated former county of Sobrarbe. In Ribagorza, another opportunity arose. The 1010 partition of the county left it divided between William Isarn, illegitimate son of Count Isarn, and Raymond III of Pallars Jussà and his wife, Mayor García of Castile, who was both niece of Isarn and aunt of Sancho's wife. In 1018, William Isarn tried to solidify his control over the Arán valley, but was killed, and Sancho jumped on the opportunity to take his portion, presumably based on some loose claim derived from his wife. Raymond and Mayor annulled their marriage, creating a further division finally resolved in 1025 when Mayor retired to a Castilian convent and Sancho received the submission of Raymond as vassal. He also forced Berengar Raymond I of Barcelona to become his vassal, though he was already a vassal of the French king. Berengar met Sancho in Zaragoza and in Navarre many times to confer on a mutual policy against the counts of Toulouse. In 1016, Sancho fixed the border between Navarre and Castile, part of the good relationship he established by marrying Muniadona, daughter of Sancho García of Castile. In 1017, he became the protector of Castile for the young García Sánchez. However, relations between the three Christian entities of León, Castile, and Navarre soured after the assassination of Count García in 1027. He had been betrothed to Sancha, daughter of Alfonso V, who was set thus to gain from Castile lands between the rivers Cea and Pisuerga (as the price for approving the marital pact). As García arrived in León for his wedding, he was killed by the sons of a noble he had expelled from his lands. Sancho III had opposed the wedding and the expected expansion of Leonese power to Castile, and used García's death to reverse this. Using the pretext of the protectorship he had exercised over Castile, he immediately occupied the county and named as successor his own younger son Ferdinand, who was nephew of the deceased count, bringing it fully within his sphere of influence. Sancho established relations with the Duchy of Gascony, probably of a suzerain–vassal nature, him being the suzerain. In consequence of his relationship with the monastery of Cluny, he improved the road from Gascony to León. This road would begin to bring increased traffic down to Iberia as pilgrims flocked to Santiago de Compostela. Because of this, Sancho ranks as one of the first great patrons of the Saint James Way. Sancho VI of Gascony was a relative of King Sancho and spent a portion of his life at the royal court in Pamplona. He also partook alongside Sancho the Great in the Reconquista. In 1010, the two Sanchos appeared together with Robert II of France and William V of Aquitaine, neither of whom was the Gascon duke's suzerain, at Saint-Jean d'Angély. After Sancho VI's death in 1032, Sancho the Great extended his authority definitively into Gascony, where he began to mention his authority as extending as far as the Garonne in the documents issued by his chancery. In southern Gascony, Sancho created a series of viscounties: Labourd (between 1021 and 1023), Bayonne (1025), and Baztán (also 1025). After the succession of Bermudo III to León, Sancho negotiated the marriage of his son Ferdinand to Sancha, the former fiancée of García Sánchez and Bermudo's sister, and along with it a dowry that included disputed Leonese lands. Sancho was soon engaged in a full-scale war with León, and combined Castilian and Navarrese armies quickly overran much of Bermudo's kingdom, occupying Astorga. By March 1033, he was king from Zamora to the borders of Barcelona. In 1034, even the city of León, the imperiale culmen (imperial capital, as Sancho saw it), fell, and there Sancho had himself crowned again. This was the height of Sancho's rule which now extended from the borders of Galicia in the west to the county of Barcelona in the east. In 1035, he refounded the diocese of Palencia, which had been laid waste by the Moors. He gave the see and its several abbacies to Bernard, of French or Navarrese origin, to whom he also gave the secular lordship (as a feudum), which included many castles in the region. However, he died on 18 October 1035 and was buried in the monastery of San Salvador de Oña, an enclave in Burgos, under the inscription Sancius, gratia Dei, Hispaniarum rex. Before his death in 1035, Sancho divided his possessions among his sons. Of the three surviving sons by Muniadona, the eldest, García, had already appeared as regulus in Navarre, inheriting the kingdom including the Basque country as well as exercising suzerainty over the kingdom's lands given to his brothers. Gonzalo had been placed in control of the counties of Sobrarbe and Ribagorza, which he would hold as regulus. Ferdinand had been given Castile on the death of count García Sánchez in 1027, holding it first under his father and later of Vermudo III of León, before killing that king to take León and the royal title. Ramiro, the eldest but illegitimate son of Sancho by mistress Sancha of Aybar, was given property in the former county of Aragón with the provision that he should ask for no more lands of García, under whom he first acted as baiulus but from whom he later achieved de facto independence. Documents report two further sons, a second Ramiro and Bernard, but scholarship is divided on whether they were legitimate sons who died in youth, or if their appearance instead results from either scribal error or forgery. Sancho left two daughters, Mayor and Jimena, the former perhaps the wife of Pons, Count of Toulouse, the latter wife of Vermudo III. Taking residence in Nájera instead of the traditional capital of Pamplona, as his realm grew larger, he considered himself a European monarch, establishing relations on the other side of the Pyrenees. He introduced French feudal theories and ecclesiastic and intellectual currents into Iberia. Through his close ties with the count of Barcelona and the duke of Gascony and his friendship with the monastic reformer Abbot Oliva, Sancho established relations with several of the leading figures north of the Pyrenees, most notably Robert II of France, William V of Aquitaine, William II and Alduin II of Angoulême, and Odo II of Blois and Champagne. It was through this circle that the Cluniac reforms first probably influenced his thinking. In 1024 a Navarrese monk, Paterno of San Juan de la Peña from Cluny, returned to Navarre and was made abbot of San Juan de la Peña, where he instituted the Cluniac custom and founded thus the first Cluniac house in Iberia west of Catalonia, under the patronage of Sancho. The Mozarabic rite continued to be practiced at San Juan, and the view that Sancho spread the Cluniac usage to other houses in his kingdom has been discredited by Justo Pérez de Urbel. Sancho sowed the seeds of the Cluniac reform and of the adoption of the Roman rite, but he did not widely enact them. Sancho also began the Navarrese series of currency by minting what the Encyclopædia Britannica calls "deniers of Carolingian influence." The division of his realm upon his death, the concepts of vassalage and suzerainty, and the use of the phrase "by the grace of God" (Dei gratia) after his title were imported from France, with which he tried to maintain relations. For this he has been called the "first Europeaniser of Iberia." His most obvious legacy, however, was the temporary union of all Christian Iberia. At least nominally, he ruled over León, the ancient capital of the kingdom won from the Moors in the eighth century, and Barcelona, the greatest of the Catalan cities. Though he divided the realm at his death, thus creating the enduring legacy of Castilian and Aragonese kingdoms, he left all his lands in the hands of one dynasty, the Jiménez, which kept the kingdoms allied by blood until the twelfth century. He made the Navarrese pocket kingdom strong, politically stable, and independent, preserving it for the remainder of the Middle Ages. It is for this that his seal has been appropriated by Basque nationalism. Though, by dividing the realm, he isolated the kingdom and inhibited its ability to gain land at the expense of the Moslems. Summed up, his reign defined the political geography of Iberia until its union under the Catholic Monarchs. Throughout his long reign, Sancho used a myriad of titles. After his coronation in León, he styled himself rex Dei gratia Hispaniarum, or "by the grace of God, king of the Spains", and may have minted coins with the legend "NAIARA/IMPERATOR". The use of the first title implied his kingship over all the independently founded Iberian kingdoms and the use of the form Dei gratia, adopted from French practice, stressed that his right to rule was of divine origin and sustenance. The latter, imperial title was only rarely employed, for it is not documented, being found only on coins only probably datable to his reign. It is not unlikely, however, that he desired to usurp the imperial title which the kings of León had thitherto carried. Despite this, the contemporary ecclesiastic Abbot Oliva only ever acknowledged Sancho as rex Ibericus or rex Navarrae Hispaniarum, while he called both Alfonso V and Vermudo III emperor. The first title considers Sancho as king of all Iberia, as does the second, though it stresses his kingship over Navarre alone as if it had been extended to authority over the whole Christian portion of the peninsula. García Sánchez III, nicknamed "the one from Nájera", King of Pamplona from 1035 until his death in 1054 and married to Stephanie of Foix. Fernando Sánchez, nicknamed "the Great", already Count of Castile, he became King of León from 1037 until his 1065 death, being Emperor of all Spain from 1056, married to Sancha of León. Jimena Sánchez, Queen consort of León by her marriage to Bermudo III of León. Gonzalo Sánchez, petty king of Sobrarbe and Ribagorza. 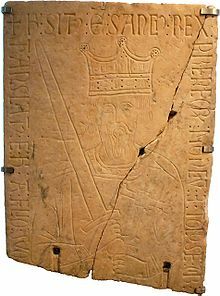 Biography*: García Sánchez II (Basque: Gartzea II.a Santxez; dead c. 1000), was King of Pamplona and Count of Aragon from 994 until his death c. 1000. He was the eldest son of Sancho II of Pamplona and Urraca Fernández and the second Pamplonese monarch to also hold the title of count of Aragon. Modern historians refer to him as the Tremulous, though this appellation likely originally applied to his grandfather, García Sánchez I of Pamplona. Throughout his reign, his foreign policy seems to have been closely linked to that of Castile. His mother was an aunt of Count Sancho García of Castile, and also of the powerful count of Saldaña, García Gómez of Carrión, and she appears to have played a role in forming a bridge between the kingdom and county. He joined his cousin Sancho in attempting to break from the submission his father had offered to Córdoba, as a result of which he had to face Almanzor. 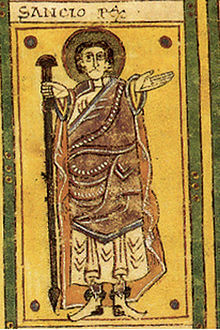 In 996 he was forced to seek peace in Córdoba. In 997 during an expedition into the land of Calatayud, García killed the governor's brother. Almanzor took revenge by beheading 50 Christians. At the Battle of Cervera in July 1000, he joined, along with Count García Gómez of Saldaña, in a coalition headed by Count Sancho García of Castile that was defeated by Almanzor (that Count Sancho led the group is thought to reflect García's decline). Tradition names him one of the Christian leaders at the 1002 Battle of Calatañazor, which resulted in the death of Almanzor and the consequent crisis in the Caliphate of Córdoba, but there is no contemporary record of him after 1000, while his cousin Sancho Ramírez of Viguera may have been ruling in Pamplona in 1002. García was certainly dead by 1004, when his son Sancho Garcés III first appears as king. Domestically, he granted the rule in Aragon to his brother Gonzalo, under the tutelage of his mother Urraca. A tradition reports that he freed all of the Muslim captives being held in the kingdom. Sancho Garcés III, King of Navarre and Count of Aragon from 1004 until his death in 1035. Elvira Garcés, nun in the Monastery of Leyre. Biography*: Sancho Garcés II (Basque: Antso II.a Gartzez, c. 938 – dead 994), also known as Sancho II. He was King of Pamplona and Count of Aragon from 970 until his death in 994. He was the eldest son of García Sánchez I of Pamplona and Andregoto Galíndez. He recognised the Kingdom of Viguera during his reign. He is sometimes referred to as Sancho Abarca by modern sources. This appellation was first applied to Sancho II by chroniclers writing centuries after his time who were confused about the succession to Pamplona, creating a single ruler out of the combined careers of Sancho II and his grandfather Sancho I of Pamplona. The weight of evidence suggests that this nickname originally applied to Sancho I.
Sancho Garcés was born circa 938, son of García Sánchez I of Pamplona, the second King of Pamplona from the Jiménez dynasty, and his first wife Andregoto Galíndez, daughter of Galindo Aznárez II, Count of Aragon. His maternal grandfather died without any legitimate male children, thus passing down the rights to the Count of Aragon to Sancho's mother who, in turn, passed them down to him and he became Count of Aragon, in 948, while still underage. He was initially under the guardianship of Count Fortún Jiménez. After the death of is father in 970, he became King of Pamplona and was known as Sancho II. He appears mentioned on the occasion of a donation to the monastery of San Juan de la Peña in 987, when he titled himself "king of Navarre", being the first to use said title. This title, however, did not come into common usage until the late eleventh century. Under Sancho, the kingdom solidified some of the gains of his predecessor, but also suffered several significant military setbacks at the hands of Umayyad troops. Navarre was linked with the Kingdom of León and the County of Castile by familial bonds, and the realms frequently worked in concert, with the Navarrese monarchy supporting the young Ramiro III of León. In 972, he founded the monastery of San Andrés de Cirueña. 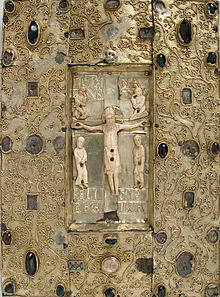 In 976, at the monastery of Albelda, the cultural and intellectual centre of his kingdom, the Codex Vigilanus was completed. It is one of the most important illuminated manuscripts of medieval Spain, containing the canons of the Councils of Toledo, a copy of the Liber Iudiciorum, and the first Western representation of the Arabic numerals, among many other texts. Upon the death of the Caliph of Cordoba, Al-Hakam II, in 976, and the succession of his son Hisham II, who had been taught by Al-Mansur Ibn Abi Aamir, the prospects of the Christian kingdoms seemed dim. The troops of Al-Mansur defeated the Christians at Torrevicente, south of Soria. Afterwards, the Muslims returned to triumph at Taracueña, near Osma. In 975, Sancho was defeated by the Moors at San Esteban de Gormaz and it has been suggested that he was captured at the Battle of Estercuel that year. In 981 at the Battle of Rueda, a dozen kilometers from Tordesillas, the Christians suffered another humiliating defeat. Because he could not defeat Al-Mansur by arms, Sancho went to Córdoba as an ambassador for his own kingdom, bringing many gifts for the victorious Al-Mansur, making a pact with him and agreeing to give the Muslim his daughter Urraca in marriage. From this union was born Abd al-Rahman Sanchuelo, the second successor of Al-Mansur who tried to usurp the Caliphate of Córdoba from the Umayyad heir. He faced further incursions from Almanzor in 989, 991 and 992, the last of which resulted in a second submission at Córdoba, and the next year he sent his son Gonzalo on an embassy to the Caliphate. In 994, the year of his death, the kingdom saw yet another incursion by a caliphate army. After his death in 994, he was buried in San Estebán de Monjardín and later, he was interred in the Monastery of San Juan de la Peña. Sancho Garcés was married to Urraca Fernández, daughter of the Count of Castile Fernán González. They had four children. García Sánchez, King of Pamplona and Count of Aragon from 994 until his death in 1000, and married to Jimena Fernández, daughter of Fernando Bermúdez de Cea, a member of very high rank among the Leonese nobility. Ramiro Sánchez, died in 992, when his parents made a donation to San Millán de la Cogolla for the sake of his soul. Gonzalo Sánchez, he was given some lands in the Aragon by his brother. [S861] Ancestry.com, online www.ancestry.com, 0861 - 7129a - Angus Archibald MacFarlane.docx. [S861] Ancestry.com, online www.ancestry.com, 0861 - 10642 - Mary Patricia MacFarlane.docx. [S861] Ancestry.com, online www.ancestry.com, 0861 - 7129g - Angus A MacFarlane.docx. [S861] Ancestry.com, online www.ancestry.com, 0861 - 7129b - Angus Archibald MacFarlane.docx. [S861] Ancestry.com, online www.ancestry.com, 0861 - 7129d - Angus Archibald MacFarlane.docx. [S861] Ancestry.com, online www.ancestry.com, 0861 - 7129s - Angus Archibald MacFarlane.docx. [S861] Ancestry.com, online www.ancestry.com, 0861 - 7129t - Angus Archibald MacFarlane.docx. [S861] Ancestry.com, online www.ancestry.com, 0861 - 7129c - Angus Archibald MacFarlane.docx. [S861] Ancestry.com, online www.ancestry.com, 0861 - 10642a - Mary Patricia MacFarlane.docx. [S861] Ancestry.com, online www.ancestry.com, 0861 - 10643 - Phillip G MacFarlane.docx. [S861] Ancestry.com, online www.ancestry.com, 0861 - 10643b - Phillip G MacFarlane.docx. [S861] Ancestry.com, online www.ancestry.com, 0861 - 10643c - Phillip G MacFarlane.docx. [S861] Ancestry.com, online www.ancestry.com, 0861 - 10644 - Paul Stanley MacFarlane.docx. [S861] Ancestry.com, online www.ancestry.com, 0861 - 10644a - Paul Stanley MacFarlane.docx. [S861] Ancestry.com, online www.ancestry.com, 0861 - 10644b - Paul Stanley MacFarlane.docx. [S861] Ancestry.com, online www.ancestry.com, 0861 - 10460a - John A MacDougall.docx.